A large fortified city under the influence of the Parthian Empire and capital of the first Arab Kingdom, Hatra withstood invasions by the Romans in A.D. 116 and 198 thanks to its high, thick walls reinforced by towers. The remains of the city, especially the temples where Hellenistic and Roman architecture blend with Eastern decorative features, attest to the greatness of its civilization. 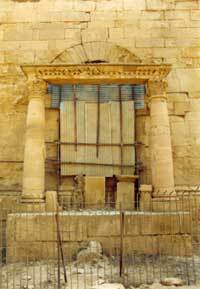 Hatra was inscribed on the World Heritage List in 1985 under criteria C (ii) (iii) (iv) (vi). Today Hatra, which remains mostly unexcavated, is in a very worrying state of conservation. Parts of the site have been fenced off to protect it from possible looting, including the small site museum, while the authorities do not have the resources required to implement an appropriate management and conservation policy. Despite this, some restoration works have resumed recently, and an Italian archaeological expedition has continued to work at the site almost uninterruptedly since 1987. 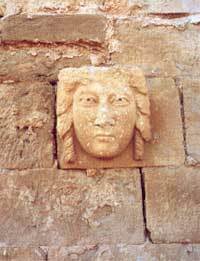 This carved head, here seen in its original location inserted in the eastern Wall of Hatra., was stolen in 1995. Discovered in London by a member of the Italian Archaeological Mission, it was recently returned to the Iraqi authorities with the help of Scotland Yard. Hatra. In the year 2000, the entrance to the main Temple has been sealed to prevent possible looting.